10,000 Carrots Rabbit Rescue needs your help. This is Sable. Look at that little nose! Tammy MacDonald-Flatt is pleading: Don’t abandon your pet rabbits. MacDonald-Flatt, president of 10,000 Carrots Rabbit Rescue, says the issue is rampant. Bunnies are being ditched in parks or wooded subdivisions when they’re no longer wanted, without the means or the instincts to fend for themselves. She estimates 95 percent of the rabbits they rescue have had this happen to them. Group hug featuring Tammy MacDonald-Flatt, Charles and Bun Bun. The problem peaks around this time of year—people have been reporting sightings every other day. MacDonald-Flatt believes it’s partially due to the amount of time gone by since Easter. 10,000 Carrots is the only rescue in the Maritimes specifically focused on rabbits. As a result, they’ve taken the fuzzy critters from as far as the south shore and Miramichi. At present, the group of seven volunteers has 27 bunnies ready to be re-homed, and there’s a waiting list on top of that. The rescue doesn’t have a shelter, so they rely on volunteers to foster. MacDonald-Flatt feels the problem is lack of education on two levels: First of all, people tend to think they can simply get a rabbit, put it in a cage and that’s all the care they require. Many also believe a rabbit can survive outside if they decide to “release” it. In fact, there are no naturally wild rabbits in Nova Scotia—only hares. And despite looking similar, there are big differences. MacDonald-Flatt doesn’t feel the message is totally getting through to the public and hopes to spread awareness. In the fall, 10,000 Carrots is rolling out an education program in order to do just that. A fundraiser in support of 10,000 Carrots is taking place at Chroma Tattoos in Windsor on July 15. Dear cat people and puppy cuddlers: If you’re in need of an animal visit, these businesses have you covered. So you want to own a hedgehog? These pointy pets are cute as hell, but not everyone knows about their challenges. Little critters saved by eagle-eyed dog walker. 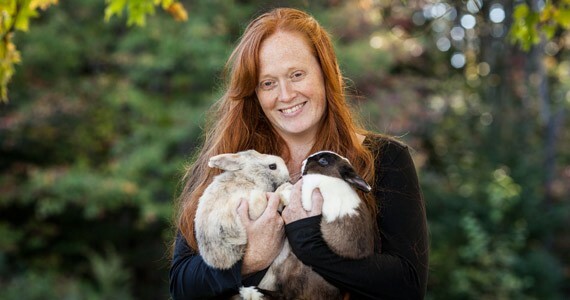 Hopping mad about discarded domestic bunnies, Halifax’s first rabbit rescue aims to adopt out and educate.